Most countries around the world have some form of restrictions on religion – whether it is through laws that limit actions like public preaching or conversion, or actions that can include detaining, displacing or assaulting members of religious groups. A subset of countries, however, has particularly high levels of government restrictions on religion. Twenty-five of the 198 countries in this study had “very high” levels of government restrictions on religion in 2016, up from 23 countries in 2015 and just 16 in 2014.26 This marks the biggest number of countries to fall in this top category since Pew Research Center began analyzing restrictions on religion in 2007. 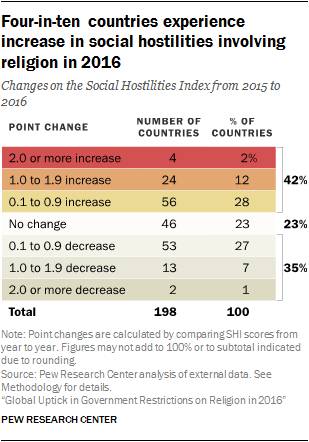 The total number of countries with “moderate” levels of social hostilities was unchanged from 2015 to 2016. Similarly, the “low” and “high” categories were also mostly stable in size, although some countries did move into and out of each of these categories. Tracking the countries that enter or exit the “very high” category of religious restrictions is useful for observing changes from year to year, but sometimes countries can have substantial changes in scores that do not necessarily cause them to move into or out of the highest category. For this reason, Pew Research Center analyzes the magnitude of changes across all countries and categories to provide greater insight into how government actions and policies can have an especially large impact on religious restrictions each year. 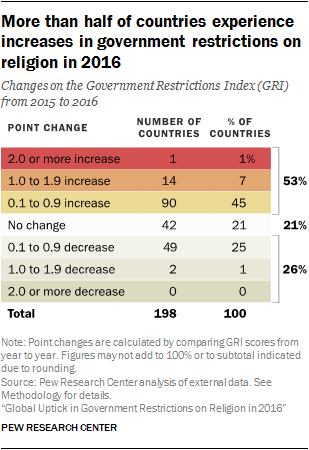 Overall, between 2015 and 2016, regardless of the size of the change, more than twice as many countries had increases as had decreases in their Government Restrictions Index (GRI) scores (105 countries vs. 51 countries). Gambia was the only country to experience a large change (2.0 points or more) on the Government Restrictions Index (GRI) in 2016. Its score increased to 3.8 from 1.7 in 2015 (bumping it from the “low” to the “moderate” category), due in part to restrictions on public preaching and religious dress. In February, the government-sponsored Supreme Islamic Council said it would ensure that Islamic scholars adhere to the acceptable principles of Islam by screening and certifying all of those who wanted to preach on local media.38 In addition, early in 2016, President Yahya Jammeh issued an executive decree that required female government employees to wear headscarves to work. The decree was rescinded a week later after criticism from opposition parties and the media.39 Still, this decree followed a presidential announcement by Jammeh in late 2015 declaring Gambia an Islamic state – a claim he reiterated in July 2016. 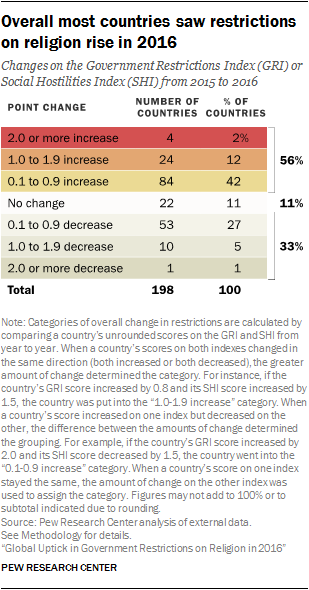 Most countries experienced only small changes (less than 1.0 point) in their GRI scores. Of the 198 countries analyzed, 49 (25%) had a small decrease and 90 (45%) had a small increase. An additional 42 countries had no change at all. Similar to the changes in the GRI index, most countries experienced only small changes in their SHI scores. Among the 109 countries that had small changes, about half (53 countries) had a decrease while the other half (56 countries) experienced an increase. Analyzing changes in government restrictions on religion and social hostilities involving religion together provides a picture of the overall condition of religious restrictions in a country, whether perpetrated by government actors or social groups and individuals. Far more countries experienced increases in overall scores rather than decreases in 2016. Among the 112 countries with an increased score, three-quarters (75%) had only small increases. About one-in-five (21%) saw modest increases in scores, while 4% had large increases in overall restrictions on religion. Nearly a third of countries (64 countries) experienced decreases in overall restrictions on religion. Most of them (83%) had small decreases in scores, while 16% had modest decreases and only one country – Niger – had a large decrease in overall restrictions on religion. 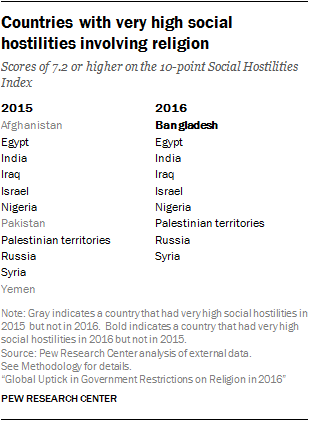 Twenty-two countries had no change in their overall score between 2015 and 2016.